The new Peugeot 108 hatchback has already proven to be a popular city car that will save you money at the filling station, and which looks as smart as they come. Some competitors might be more fun to drive, but if you’re on the lookout for a stylish small car that offers plenty of value for money, you can’t go far wrong with this one. 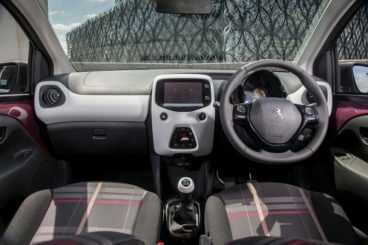 Replacing the outgoing Peugeot 107, the 108 shares parts with Citroen and Toyota city cars, including its underpinning. This one comes complete with a full-length folding fabric roof, is well-equipped and has been rated highly by customers when it comes to overall satisfaction. 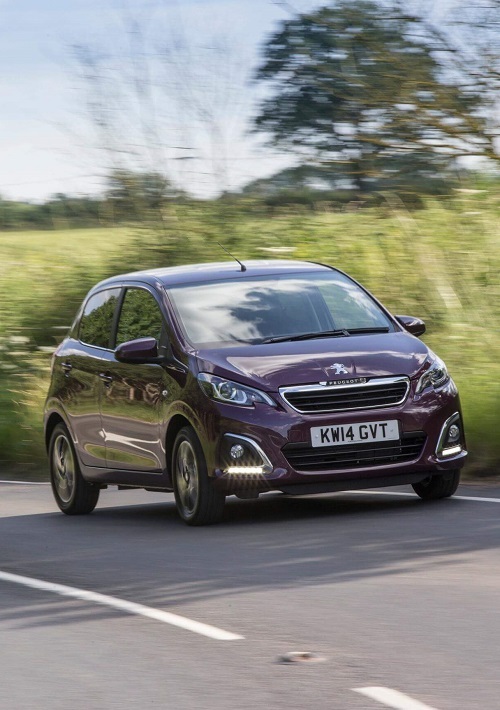 OSV takes a closer look at what it’s all about with our Peugeot 108 Top Hatchback review. The new 108 top hatchback is not the most entertaining car to drive in this class, but it represents a massive improvement on its predecessor. It’s better engineered, the ride quality is now decent, while the light steering is impressive. It’s designed especially for the city, and Peugeot has got a lot of things right here. Unfortunately, there are no diesel engines in the range, so your choice is limited to a pair of petrol units. Opt for the least powerful of the two and you’ll find it more efficient, while you can also pair it up with the Start & Stop system, which further improves efficiency. You can also substitute an automatic ‘box for the 5-speed manual transmission. This 1.0-litre petrol is highly capable when buzzing around the town. It’s agile, nippy and easy to drive. If, however, you know you’ll be heading out on the motorway regularly, you might want to plump for the bigger 1.2-litre petrol engine instead. It’s faster at higher speeds, taking 15.9 seconds to get from rest to 70mph. The 1.0-litre power plant takes an incredible 29.8 seconds to cover the same distance. The 1.2-litre unit gets you from a standstill to 62mph in 11.0 seconds, while the less powerful engine takes 14.3 seconds. The 1.2 is actually among the quickest in this class, but you can only get it if you opt for either the Allure or the Feline trim. The 1.0-litre unit, meanwhile, is only available with the two base-level trims, Access and Active. Essentially, this is a small car that has grown up. The fabric roof is a great touch, you don’t need to wince each time you see an oncoming pothole, and sound insulation is a lot better. The 107 was ridiculously loud, but the new 108 does a good job of blocking out most external noises. And, no, this doesn’t mean you have to turn your radio right up! The dashboard is simple, user-friendly and clean – exactly what we want. It comes complete with an easy-to-use seven-inch touchscreen, while the dials are also easy to operate. Everything is logically arranged and simple to find. There is enough room for four people to sit in relative comfort here, but you’d need to go for the five-door model if interior space is a priority. However, you can’t get the five-door with the base-level Active trim, which comes only as a three-door. The car is rather short, measuring just 3.5 metres, but it’s easy to skip through traffic and park. Visibility is good. Space is decent upfront, while the adjustable steering wheel and driver’s seat help you get comfortable. Rear seat room is at a premium, but two adults should be fine. The 196-litre boot isn’t bad but far from class-leading, but its low load lip means it’s very usable. All models get LED daytime running light, electric front windows, as well as bags of safety equipment. The Active model adds air conditioning, bigger wheels, a height-adjustable driver’s seat and Bluetooth connection, while the Allure range throws in alloys, a reversing camera and keyless go. The Feline trim, meanwhile, treats you to leather seats and climate control. This Top hatch model is available from the Active trim upwards. 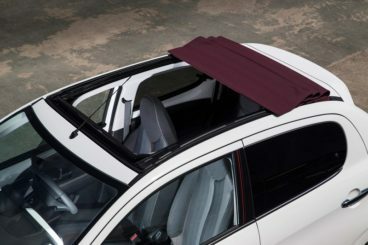 The fabric roof costs £900, and works in a similar way to the one found on the Citroen DS3 Cabrio. Prices for the new car start out from around £8,500 and rise to almost £14,000. If you’re thinking of leasing this fabric top variant over three years on a personal contract hire, you’d be looking at paying somewhere up to £220 + VAT per month. Not a single engine will cost you anything in road tax, as all emit less than 100g/km of CO2. This is pleasing news in light of the fact that their diesel engines are absent from the range. The small 1.0-litre petrol unit is the most economical. Paired up with a manual transmission, it’s capable of achieving fuel economy returns of 69mpg while emitting 95g/km of CO2. You can also get it with an automatic ‘box and the numbers won’t change too much. The more powerful 1.2-litre petrol engine achieves fuel economy of around 65.7mpg and is also free to tax. You can get the less powerful 1.0-litre engine with this 108 top hatchback model, but if you opt for the entry-level Access trim in the 108’s range, you won’t be able to get the 1.2-litre engine. The car holds onto its value well after three years, though depreciation does get worse the further up the trim levels you go. The Feline model, for example, isn’t expected to hold onto more than 44% of its purchase price after three years of ownership. The car doesn’t cost much to insure, with the range-topping model occupying insurance group 11. A typical three-year/60,000 mile warranty is offered. Repair costs will generally be low, but you will need to take it to your dealer annually. Standard equipment across the range is very good for a city car, which makes it fantastic value for money. Access buyers can expect to get treated to remote central locking, a height-adjustable steering wheel and 14” steel wheels among other goodies plus important functions that entry-level city cars normally miss out on. Despite the lack of a diesel option, the 108 top hatch is still very cheap to run, with no model achieving worse returns than 65mpg. This is easily one of the standout lookers in the city car class. The narrow headlights and floating chrome grille are particular highlights that give it an upmarket feel, while a spoiler does a good job at hiding the rather inexpensive-looking external boot hinges that blighted the 107’s appeal. There are also a pair of paint schemes available to give it even more character. The 1.0-litre power plant is inexpensive to buy and run, but while it’s good enough pottering in and around the city, it will start to dawdle and flag once you get it out on the motorway. It’s one of the best-looking cars in this sector, but it’s also one of the smallest. This means interior space is not fantastic, and while you can squeeze four adults in here, rear legroom is at a premium. The Peugeot is certainly a smart-looking city car that offers plenty of value for money. But let’s see how it fares against its rivals in the comparison section of our Peugeot 108 Top Hatchback review. The new Hyundai i10 Hatchback has got all the equipment to be the best city car around. It’s stylish, spacious, and costs next to nothing to run. The suspension is a bit stiff, but this is either going to be a plus or a negative – it just depends on personal opinion. Either way, the car is very good when pottering around the town. Visibility is fantastic, and it’s so nimble on its feet that parking is a bit of a dream. Moreover, the stiffer suspension rewards you with agile handling. Like the Peugeot, there are no diesel engines on offer. There are a pair of petrol engines available, and they both record similar sprint times to the 108’s. The 1.2-litre petrol, for example, gets you from 0-62mph in 12.3 seconds. It’s comfortable at higher speeds, but performance is blunted if you opt for the automatic ‘box. Although there are no diesel engines in the range, the petrols are small and the Hyundai itself is also compact. As a result, running costs are kept low. Unlike the 108, though, not all models are free from tax. With that said, the most expensive model will only cost you £30 per year in tax. The smallest engine is a 1.0-litre 65bhp unit which, while fairly underwhelming on the motorway, is at home in the city and achieves fuel economy returns of 60.1mpg while costing just £20 per year in tax. If, however, you opt for the SE Blue Drive Version, you will benefit from stop-start technology, which improves fuel economy to 65.7mpg. This variant is also free to tax. 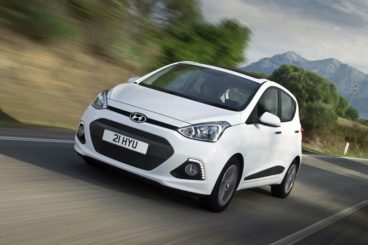 Hyundai offer a five year warranty with the i10, which puts Peugeot’s 3-year warranty in the shade. Like Peugeot, Hyundai has worked hard to improve this car’s interior. It’s now smartly designed, with impressive materials making up the cabin. The dashboard either comes in a red, orange beige or bright blue metallic finish (it’s up to you), and while these bold colours aren’t going to suit everyone, it’s nice to see a brand adding some flavour to their interior. The Hyundai’s 252-litre boot is class-leading, while practicality, on the whole, is good. The steering wheel and driver’s seat are adjustable, and each model comes as a five-door. Visibility is fantastic, while interior space is good. The rear seats are liveable even on longer journeys, and access is easy thanks to wide opening doors. 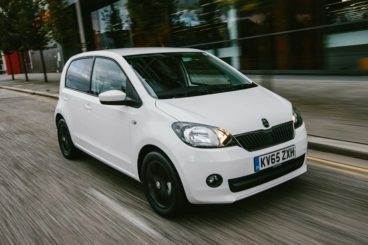 The new Skoda Citigo Hatchback has finally grown up. It’s a solidly built city car that still parties when you want it to, but there is now a maturity here which makes it feel like one of the best cars of its type that’s been made. Like the Peugeot, the Skoda doesn’t offer any diesel engines. There isn’t much to choose from in terms of the engines at all, with just a 1.0-litre petrol that comes in two separate power guises. The 59bhp variant takes 14.4 seconds to get from rest to 62mph, and while it feels decidedly slow, the engine sounds satisfying when you work it hard. It offers plenty of grip and resists body lean in bends. The nippier 74bhp variant takes 13.2 seconds to cover the 0-62mph dash. It’s not as fast as the 108 Hatchback, which covers the same distance in 11.0 seconds. Worse still, it doesn’t really feel any quicker than the 59bhp unit. Each engine comes with a 5-speed manual transmission as standard, but there is a 5-speed automatic ‘box available as an option. The Skoda is cheap to run, with the cheapest in the range benefiting from the Start-Stop system to achieve fuel economy returns of around 68.9mpg. It’s also free to tax. The more powerful 74bhp unit is capable of returning 67mpg and is also exempt from road tax thanks to emissions of 98g/km of CO2. Skoda has done a good job of making the Citigo Hatchback feel bigger inside than its compact dimensions would suggest. Ride comfort is good, but the dashboard is a bit too plain for our liking. Everything screams VW Group, though, which means top-notch build quality is assured. Head and legroom is good both upfront and in the back, and once you accept its obvious limitations, four of you should be able to travel in relative comfort here. The 251-litre boot offers 50-litres more space than the 108’s. There isn’t a lot to separate the best cars in this sector, of which the 108 is certainly one. Indeed, your choice is going to be swayed by the details, such as this car’s fabric roof or the Hyundai i10 Hatchback’s five-year warranty. But what’s the real deal breaker here is the 108’s sheer amount of standard equipment. For small car cash, you get plenty of big car features, including lots of useful standard kit across the range that its rivals don’t give you. It might not be the absolute standout choice, but the good-looking Peugeot 108 Top Hatchback is a smart one. Looking For A Price For The Peugeot 108 Top Hatchback?